Jose Mourinho has clearly attempted to warn potential suitors off signing his star Chelsea player Eden Hazard today, by insisting he would cost £200m for clubs like Real Madrid to sign, according to BBC Sport. Watch Chelsea goal videos with our FREE Sports video app! It remains to be seen if the Belgian international will ever look like being worth that kind of money – it’s certainly not unthinkable given the way players’ prices have rised in the modern era, with the 24-year-old arguably better than £85m Bernabeu star Gareth Bale ever was, and with crazy figures and transfer fees seeming to go up all the time. There will surely be a £100m player before long, and it could be Hazard, and maybe the player himself should hope it is. As he is now, it’s hard to see Hazard becoming the best player in the world in the Ronaldo or Lionel Messi bracket if he stays where he is, or certainly if he continues to play under the guidance of Mourinho, who for all his qualities, doesn’t really get the best out of world class attacking players. Critics will immediately point to Didier Drogba, Zlatan Ibrahimovic, Diego Milito – great strikers who have taken their game to a new level under the Portuguese’s coaching – but they are not the same kind of player; Cristiano Ronaldo would be a better comparison, though it’s fair to say the 30-year-old is a pretty unique phenomenon who was already utterly world class under Sir Alex Ferguson and on his way to achieving even more with Real Madrid. Equally, it might also be fair to say that the environment in Madrid forced Mourinho to field a more attacking lineup than he would normally like, with signings like Mesut Ozil and Angel Di Maria not the kind you could imagine him making or fielding regularly at Stamford Bridge, where a workhorse like Willian is preferred in attack to outcasts like Juan Mata, Kevin De Bruyne and Juan Cuadrado of the second Mourinho era. Hazard has a Ronaldo-like style and air about him, that sheer class that gets fans off their seats, but how much better could he be, and how many more goals could he score if he were playing in a Real Madrid or Barcelona team? There’s only so far he can go with a team like Chelsea, who had 32.9% posssession against Manchester United last week (enough for him to score the winner), and who rely on him as their sole flair player. It would be a waste of his incredible natural talent if we never got to see him alongside more similar players such as Neymar, Bale, or others like Marco Reus who will almost certainly join an elite club in the near future. Even his old Blues colleague and fellow countryman De Bruyne has benefitted from leaving Stamford Bridge, managing an overall goal contribution of 37 this season (15 goals, 22 assists) in comparison to Hazard’s 28 (18 goals, 10 assists) simply from playing in a more adventuruous Wolfsburg side. £100m or £200m, Hazard should hope – as should fans of the game – that there is a price that can see potentially the Ronaldo or Messi of his generation move to a team more deserving of his talent. 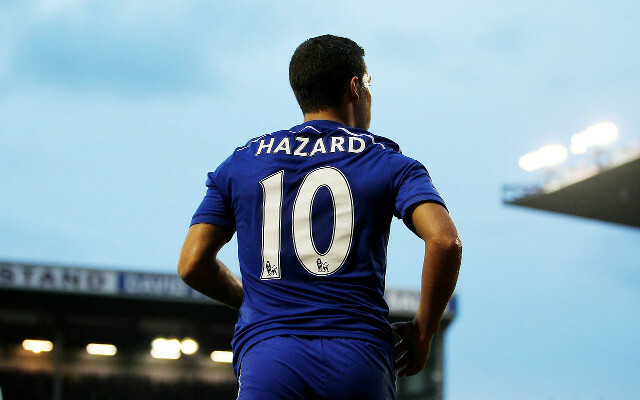 Top 50 best players in Europe 2014/15 – where does Hazard rank?